All the colours make me happy. I already have the colours covered in my bag capsules so this is not at all a need - just a want because wardrobe pets are my thing and I have some Summer budget left in the kitty. This is a great quality piece at a good price. Lightweight an comfy to carry too. Yummy colours - at least to me! Love the high-shine. Which colour shall I get, ladies? ETA: Placed an order for the Poppy. Wasn't feeling the yellow as much, and didn't want the blue to compete with my special HK Furla (and I have 3 blue bags already). Well done to those who chose Poppy for me. I kind of like the blue, but then I like blue. Does it come with a strap? I really love the blue think I'll vote for the yellow. Would it work in your citron capsule? Cobaltblue, I wear citron bags like a neutral. It will work with many, many outfits. Mmm. Put them all on your bed and let's see which one Sam sits on? I'm drawn to the poppy one. They're all so happy you can't go wrong, though. Ok, more seriously, I like the contrasting orange lining better with turquoise. Aha, yes. Skylurker. I need to consult with my pint size in-house fashion stylist too. Columbine, you're probably right. ALL good. Hehe, Skylurker is right, Sam would do a brilliant job choosing. I have a thing for a red bag every time. Nancy, Peri and Columbine, the poppy is pretty isn't it. Great with denim. I vote blue, then yellow. The poppy one doesn't seem quite as saturated a colour as you usually wear, it's almost heading in to pastel. I hope things don't fall out of the handle holes! Elizabeth, I think it's the shine on the poppy that's making it look a little mid-tone. Sterling, the yellow is yummy. Hmm. I like the poppy. I vote poppy, so fresh! Red red red! Did I mention red? The red one is a really good, poppy red. The yellow one looks off -- it's sort of a Ronald McDonald yellow. Might just be my screen, though. The blue one is nice, but the red is better and I feel like it would be more versatile, if only because it would go better with blue denim, which you will always come back to. (Both the red and blue ones would go well with white denim, mind you, and I know you're really into white denim at the moment). I'm definitely leaning towards one colour already.....and have also almost ruled out a colour. E, I've been into white denim for a long time. Since I was 14 years old. And blue denim has always been there too. Wow, Angie, you look so great in all those colors combined! I think I'd look insane in the same outfit. I love the way you dress. Fun bags! I'm partial to the blue one. Happy colors! 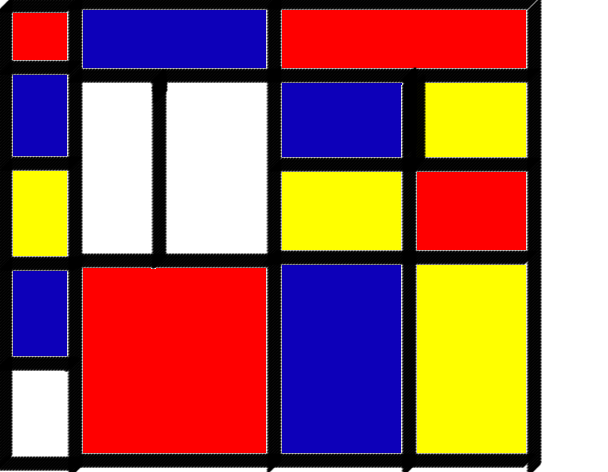 Made me think of a Mondrian painting. Yellow! Love it! Second turquoise, third red. Angie, I know you've always liked white denim -- but I feel like you are particularly into it at the moment, because you've been singing its praises a lot lately! And I think you mentioned that you currently have three or four pairs of white jeans? I vote: 1. red; 2. blue; 3. yellow. I think a smaller bag like this wants to sing - so either blue or citron. I feel the red is a little expected. I mean, *I* have a red clutch, and while I'm quirky, I'm expected. Lol.